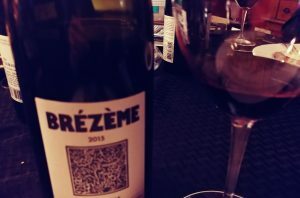 This month’s Winophiles theme is biodynamic wines of France. The full practice and rationale behind biodynamic is complex and worthy of a full post on its own. The quick version is that it is one of the oldest forms of sustainable organic agriculture. It was developed by Rudolf Steiner in the 1920s in response to a group of farmers who were disappointed by the new commercial farming methods. Steiner himself is a problematic character – he was, like many of his time, an open racist and anti-Semite and some of his writing about ideas of “purity” of the land are pretty uncomfortable to read today. However, his work has gained a wide following and as the consumer has developed an interest in putting their money where their values are these types of practices are becoming much more common and mainstream. Biodynamic practices are an extreme and mystical version of organic. Not only does it forbid using many types of chemical fertilizers and pesticides, as is common in organic farming, biodynamic practice also treats the vineyard holistically. It sees the farmstead as a closed system and requires the use of manure fertilizers from animals which are from the same land as the crops. It also includes many practices that are mystical in nature and based on principles of astrology and mysticism. The most well-known and often joked about is Steiner’s “preparation 500” which involves planting a cow’s horn with cow manure and burying it in the field in the autumn leaving it do decompose over the winter before being dug up and used as a spray on the field to prepare the soil to be fertile during the growing season. If you’ve ever been to a tasting and someone has said something about the wine being either good or bad that day because it’s a root or leaf or flower day, they’re referring to the biodynamic calendar. The practice of biodynamic is controversial in the wine world. There are those, both on the wine production side and the wine sales side, that swear by it. There are also those who consider it pseudo-scientific nonsense. The way that I look at it, the mystical stuff may not have an effect but the practice itself takes time and effort. If you’re spending extra time in your field, looking at your crops on a daily basis, making sure to intervene early when you see a problem like pets or rot, the attention to detail is going to lead to a quality product. I’m also a fan of using the minimum intervention in agriculture. It’s better for the land, the people who work on it and the local environment to use fewer pesticide and fertilizer applications. The semester just started this week, so we’ve been keen on nice meals that are fun and easy to put together. It’s also been a cold week, so we wanted something that was both quick to assemble and hearty. We grabbed some merguez out of the freezer case along with some four-cheese shepherd’s purses. 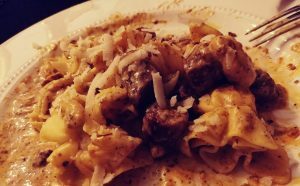 When we got home, I discovered a yellow pepper that was getting to the “use me right now or else” phase of its life and came up with a yellow pepper and mushroom quick cream sauce to serve with the pasta. 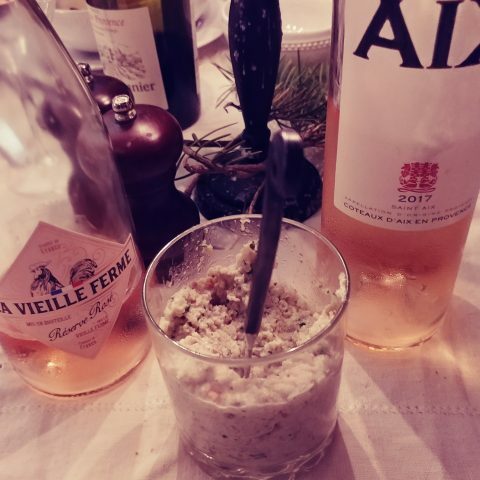 A nibble of rillettes and brie while the sausages cooked completed a great meal which went very well with the wines, came together quickly and made us feel contently full and warm on a pretty blustery night. 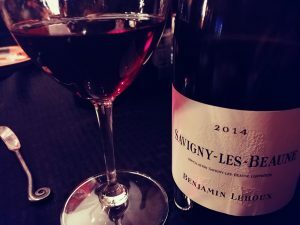 A note on the wines for this month: as I said above, certification is a long and expensive process. The wines that we tasted this month do not carry the Demeter logo because they are all done partially with biodynamic processes. Some are in transition – some vineyards have moved to complete biodynamic practices while others haven’t been using those practices long enough to qualify for the certification. Shows as clear, pale ruby in the glass with silky tannins, high acid and a clean, intense and complex nose. The nose shows dried berries, a hint of trailmix, cranberry, strawberry red cherry, vanilla, smoke, mushroom and forest floor. 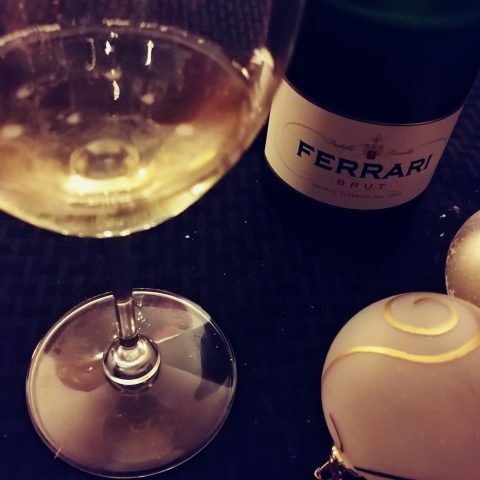 The palate is intense and a little bit fresher and more mineral than the nose. The dominant note is wet rock, sage, ripe fruit notes of cranberry and strawberry with vanilla and smoke notes. The palate shows less development than the nose does, but there are some underlying hint of mushroom and forest floor. The acid is a little bit out of balance and sharper than the tannin is right now. The wine is drinking nicely now but will likely come together a bit in time when the acid mellows out a little and comes into better harmony with the tannin and the fruit. The finish is a little short but it is nicely complex and it’s a good wine with food. Can hold 5 years. 55% Grenache, 25% Syrah, 10% Carignan, 5% Mourvedre and 5% Cinsault. Produced according to some biodynamic practices (natural manure, no herbicide, pesticide, insecticide). The reserve label is a limited release for American import. The wine is pale ruby. It has high acid and medium, relaxed tannin. Dry with medium alcohol although the alcohol is warming and a little pronounced. The nose is medium intense with a nose of candied fruit, fruit cake, baking spice, vanilla, smoke, black plum, red and black cherry, cola. The palate is a little more intense than the nose, opening with red and black cherry, menthol, cinnamon, vanilla. The wine is still very youthful but is very expressive of the 2015 vintage’s elegance and power. Right now it’s a little all over the place, indicating that it still needs some time to come together. A good wine with moderate complexity and medium length. Is drinking fine now, but some time in the bottle will help it pull together and see its full potential. Can continue to develop for 5-7 years. Deep ruby, high acid, high but silky and smooth tannin. Nose is very intense and shows a hint of brett (in this case, not a flaw. It’s very subtle and in control). Strawberry, red cherry, branble, vanilla, barnyard, black olive and red plum with the fruit very well balanced with the herbal/earthy notes. The palate is also very intense with predominant fruit – red plum, red cherry, strawberry, vanilla and forest floor. The balance between the acid, fruit and brett is lovely. The finish is very long with the fruit predominating over the brett. Very intense on both the palate and the nose and the long finish really shows off the complexity of the wine. This wine is outstanding and drinking very, very well right now but also has a lot of life in it. Potential to hold and continue to develop for 5-10 years. Texier is one of the noted and best-capable natural wine makers in France. He is not certified biodynamic because he embraces the plant-based preparations of the method, but rejects the animal-based ones. All the wines were fantastic with the foods. 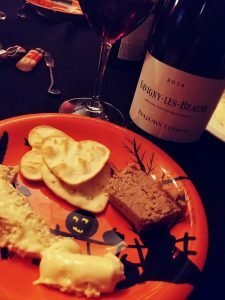 The Savigny-les-Beaune was light and fresh, which made it a perfect pair with the unctuous duck rilletes and the paste of the brie. You can never go wrong with Rhone and sausage. Grenache is one of my favorite red wine matches with spicier foods and both more than held up to the spicy merguez. 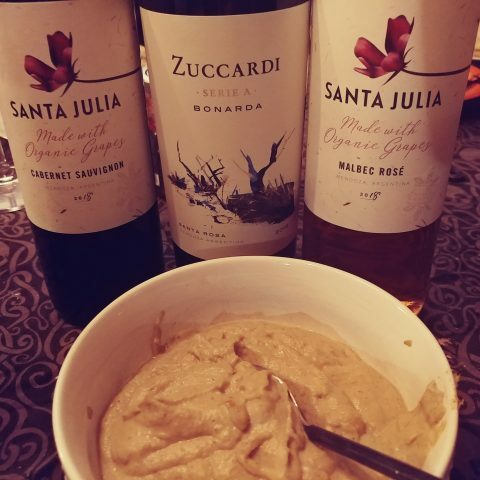 Red wines with spicy foods can be a challenging pairing, but it is definitely doable. The key things to look at are how the tannins are structured. All the wines I tasted were either in the medium range or had particularly silky or smooth tannins. The least successful of the pairings was the Janasse because the alcohol seemed so warming (it’s only 14%, so definitely not high alcohol). The baking spice notes made the alcohol feel a bit more present and spicy which enhanced the spice in the merguez in a way that was a little more than I felt like that night, so we mostly set aside that bottle and finished it while we chatted after dinner. Chop the vegetables and garlic and saute in 2 tbsp butter until soft. Add the flour and the remaining tablespoon of butter to the pan and cook, stirring until the flour and butter have incorporated and the flour is starting to brown. Deglaze the pan with the white wine and then add the spices and the half and half or milk/cream mixture. Place the pan on simmer and allow to thicken. Meanwhile cook the pasta. When the pasta is just about ready, use a hand blender (or carefully transfer the sauce mixture to the blender) and blend until smooth. Place the warm pasta and sauce back in the sauce pan and toss to coat. Serve either alone with a tossed salad and some crusty bread or add a protein. I like this with merguez or another sausage with some heat to it. Sounds like my kind of meal! Great explanation of biodynamics basics and the ins and outs of certification. Interesting how the wine maker is deciding what preps and aspects of biodynamics to follow. Thanks for participating! How interesting about the early start of bio dynamics and it’s founder. Thanks for sharing. The “not wanting to have hands tied” as you mentioned above comes up often. In talking to some growers last year they discussed in order to protect your crop without using synthetic chemicals sometimes you have to use a huge amount of organic chemicals. The question becomes is more organic chemical use better than judicious use of synthetic in a bad year? It might be better for the environment but… just because it is organic doesn’t mean it is necessarily good. Copper sulfate does not biodegrade and can accumulate to toxic levels. Overall, this is a difficult topic! Great write up/ The in’s and out’s of certifications are indeed complicated. I too have heard from many wonderful producers on the many reasons they choose to not seek certification. It’s also interesting to note that the specific requirements to strictly follow the practices for certification don’t necessarily suit every location. What a beautiful post with pairings to match. The rilletes, merguez and mushroom cream sauce sound divine and thoughtfully composed. I enjoyed reading how it all came together. Eric Texier! Good choice. Do you have a fabulous wine shop nearby?